A couple of weeks ago, I was in Mexico visiting my family. It turned out that all my siblings were together in the same place after more than a year. One of my sisters lives in Austin, my brother in Vancouver, I live in LA. Such an occasion had to be celebrated somehow, so my baby brother and I decided to cook a fancy dinner together, to treat the entire family. My gigantic baby brother is studying chemistry, and he started a class on the chemistry of wine last semester. Therefore, we decided we were going to experiment and do a 5 course meal with matching wines, based on what he’s learned so far. 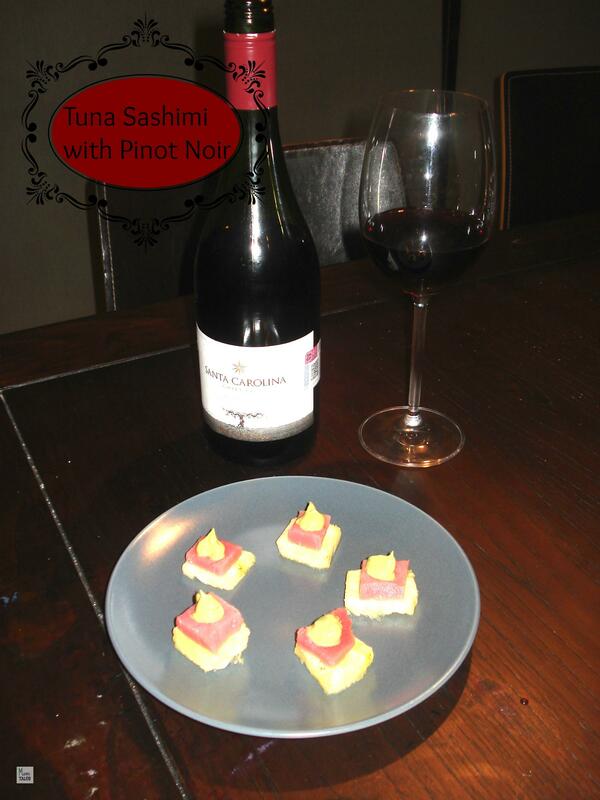 We matched the meaty texture and flavor of the tuna with a Pinot Noir wine. I got the recipe from Meatified, and it looked absolutely delicious. Unfortunately our tuna wasn’t the best sashimi quality fish, so the combination wasn’t that great. The fish tasted fishy, and that ruined it for me. I would try this again, but with thinner pineapple slices and the best quality fish. The avocado-ginger cream was delicious, as was the wine. Click on the Meatified link above for the recipe on how to make this dish. I did not know this wine before, and the combination of the apple and the wine was absolutely stellar. 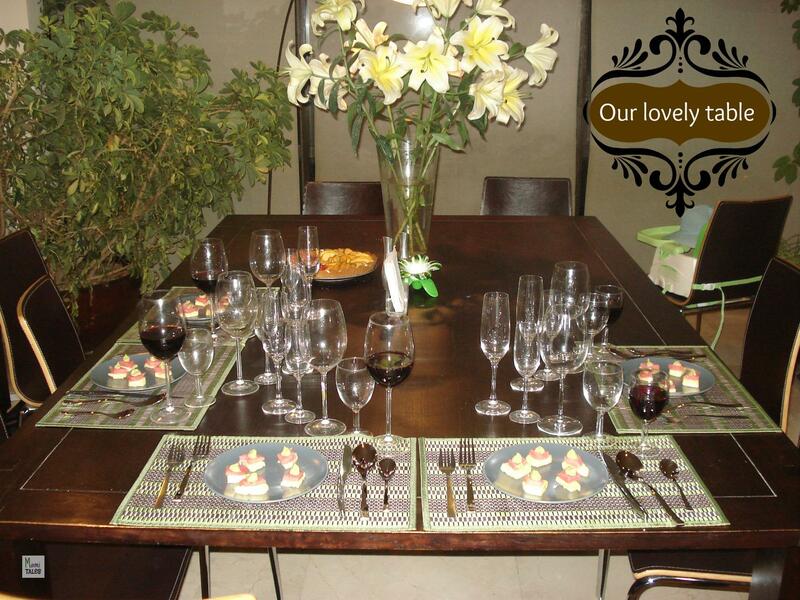 When the wine pairs up with the food successfully, the result is such that the flavor of the food is intensified and the palate opens as if your taste buds had an amplifier. The wine was good, the soup was delicious, but put together, we were in heaven. The recipe for the soup I got from The family cook book project. 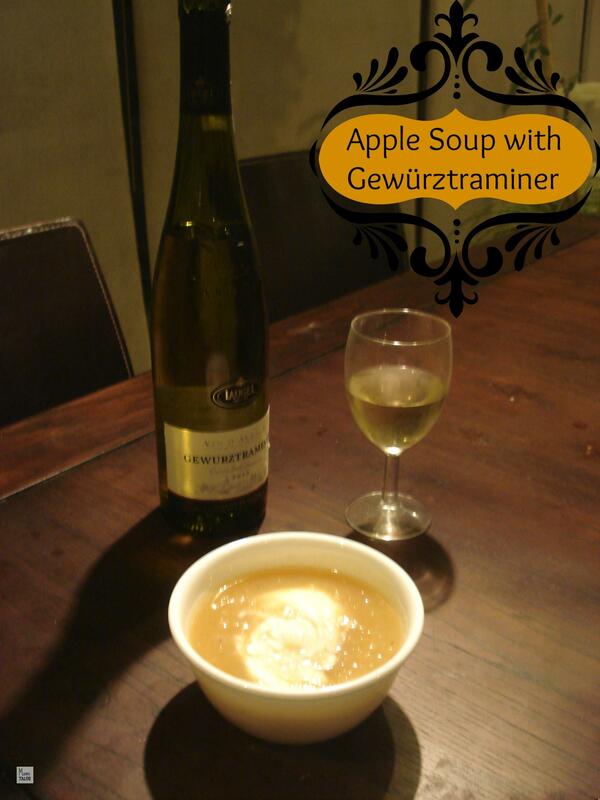 It is a fabulous choice for a hot summer day, as it is served chilled (both soup and wine). I found this recipe on Food Republic. I think that of the entire meal, this was hands down the best dish. I used dried marjoram leaves instead of fresh, but the taste was absolutely wonderful. Unfortunately, the pairing with the wine was definitely not the right one. 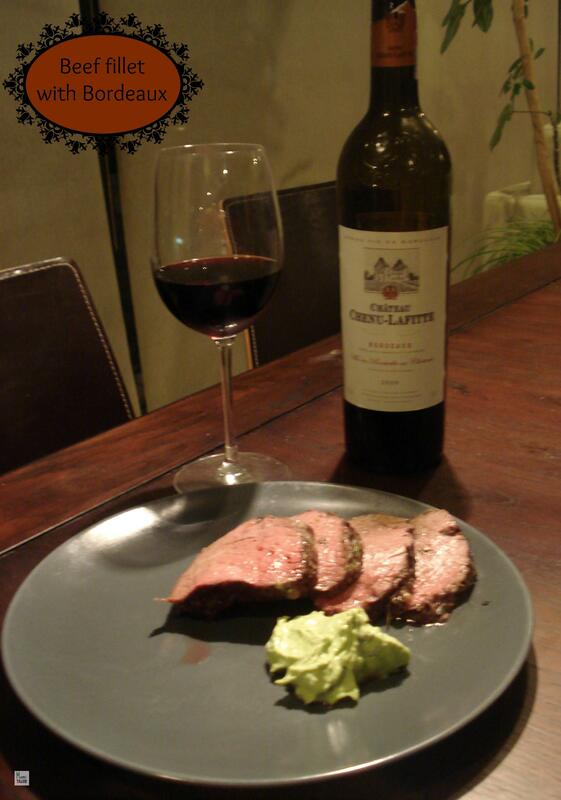 I suspect a more peppery, more full-bodied red would have worked better, like a Rioja or a good Cabernet Sauvignon. Ever since we started thinking about this dinner, my brother was adamant about doing Roquefort and Sauternes together, as his teacher said it was one of the best matches. French style, we decided to do a cheese course after dinner and before dessert. I found this strange recipe combining Roquefort cheese balls and dark chocolate. It was just too weird not to try, so we went ahead and did it. The original recipe is in Spanish, from Lazy Blog. I’ll post the recipe in English in the next few days, as it really was delicious! I used a 71% chocolate bar instead of the chocolate fondue they call for, and the result was wonderful. Our lollipop “sticks” were not the most fashionable, but they served their purpose. The combination of the strong cheese, bitter chocolate and sweet sauternes was amazing. For the last course, I chose the wine and researched what would go best with it. 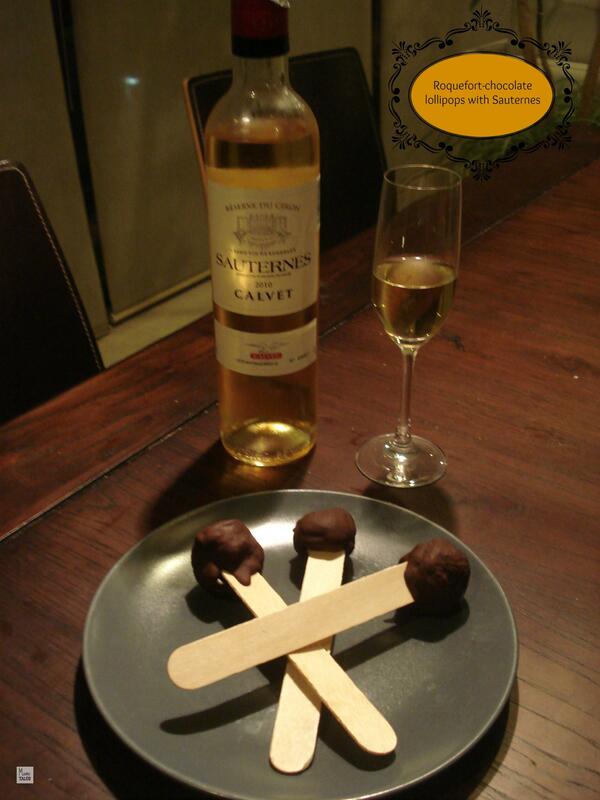 Moscato d’Asti is a sweet Italian bubbly dessert wine, light and very fruity. I created a recipe for this match, which turned out to be a Fresh peach and Mascarpone cheese tart drizzled with cardamom syrup. The lightness and fruitiness of the wine goes perfectly well with the subtle flavors of the fresh peaches and the cardamom syrup. My brother hadn’t tried this wine before, and he was pleasantly surprised. The recipe for this tart is here in my blog, so just click on the picture and it’ll direct you to the page. I wish my brother and I had more time to do more experiments and put together the perfect matched wine meal, but for an afternoon together, I was very happy with the results. And my mom and sisters were very happy to try everything! If you have a special wine-food combination you love, please leave me a note in the comments section so I can try it too! It’s so much fun pairing courses with libations, isn’t it? I once had a 14-course meal in Rioja, Spain at which each course was paired with a diff wine or libation. Needless to day the meal took 4 hours to enjoy, and was one of the finest dining experiences I’ve ever had. 14 course meal in Rioja? Wow… you were living my dream! I once had dinner with matching wines in a two Michelin star restaurant in Brussels and it was absolutely memorable. Maybe one day I’ll make it to Rioja and dine for 4 hours with delicious food and wine too!